Lettuce (Lactuca sativa) is an important vegetable crop grown in the United States. Lettuce yellows (previously termed lettuce aster yellows) is a devastating disease commonly found in lettuce fields and causes significant economic loss to growers, damaging 40-100% of the crop in some seasons (Thompson, 1944). The causal pathogen was not verified until a phytoplasmal aetiology was confirmed by molecular means (Lee et al., 1998). In 2013, an epidemic of lettuce yellows occurred in the Winter Garden region of Texas. The infected plants were stunted with blanching and chlorosis in young heart leaves (Fig. 1). A total of thirteen samples from two different farms, including three apparently lacking symptoms from Romaine and leaf lettuce cultivars, were collected and tested for phytoplasmas. DNA was extracted from leaf veinal tissue, and nested PCRs using universal primer pair P1/16S-SR, followed by R16F2n/R16R2n and P1A/16S-SR, were performed as described previously (Lee et al., 2004) to detect the presence of phytoplasmas in the samples. The taxonomic affiliation of the putative phytoplasmas detected was determined by RFLP analysis using nested PCR products (Lee et al., 1998; Zhao et al., 2009). 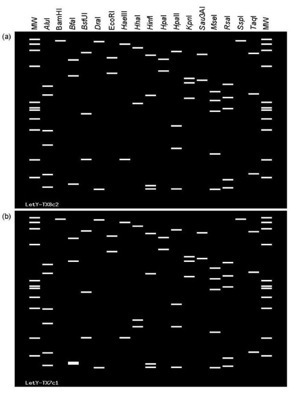 A nested PCR using primer pair rpF1/rpR1 followed by rp(I)F1/rp(I)R1A as described previously (Lee et al., 2004) was used to amplify a phytoplasma DNA segment (about 1.2 kb) of the ribosomal protein (rp) operon that encompassed genes rplV (rpl22) and rpsC (rps3); and a nested PCR using primer pair AYsecYF1/secYR1(I) followed by AYsecYF1/AYsecYR1 (Lee et al., 2006) was used to amplify a phytoplasma DNA segment (about 1.3 kb) of the partial spc operon that includes the complete secY gene. Four PCR-amplified products from each of 16S rDNA, rp, and secY genes were cloned and sequenced as previously described (Lee et al., 2004, 2006), and deposited in GenBank (Accession Nos. KF573449-KF573456; rp, KF573441-KF573448; secY, KF573433-KF573440). The results indicated all 13 lettuce samples were infected with phytoplasmas. Both lettuce cultivars were infected with 16SrI-A and 16SrI-B phytoplasmas (Fig. 2). Phylogenetic analysis with 16S rRNA (Fig. 3), rp (Fig. 4) and secY gene (Fig. 5) sequences confirmed the presence of two distinct lineages (Fig. 3). This is the first report confirming that lettuce yellows in Texas is associated with two distinct phytoplasma strains. The finding implicates that multiple vectors may be involved in the disease outbreak. The information on identities of associated phytoplasmas should facilitate formulating effective strategies to combat this newly emerging lettuce yellows in Texas. 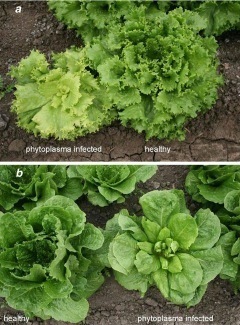 Figure 1: Leaf lettuce (a) and Romaine lettuce (b) exhibiting stunting, leaf chlorosis and blanching symptoms induced by aster yellows phytoplasma infection. Figure 2: Computer-simulated virtual RFLP patterns derived from in silica digestions of phytoplasma 16S rRNA gene (1.2 kb fragment) of (a) LetY-TX8c2 and (b) LetY-TX7c1 with 17 enzymes. Lanes MW, HaeIII digest of ΦX174 RFI DNA; fragment sizes (bp) from top to bottom: 1353, 1078, 872, 603, 310, 281, 271, 234, 194, 118, 72. 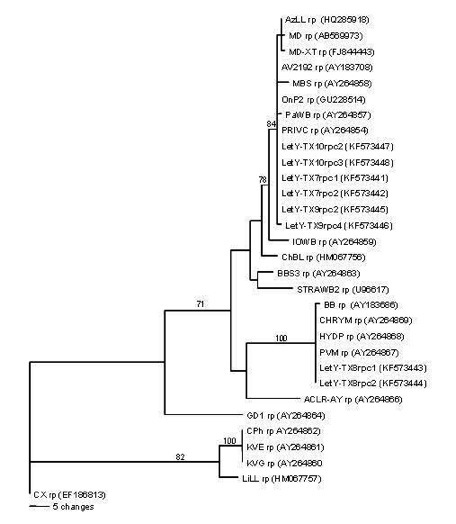 Figure 3: Phylogenetic trees constructed by parsimony analyses of 16S rRNA gene sequences from 16SrI phytoplasma strains. Canadian peach X (CX) phytoplasma was used as the out-group to root the trees. Bootstrap values are shown on the main branches. Bars indicate inferred character state changes. Sequences submitted to GenBank in this study are in bold. 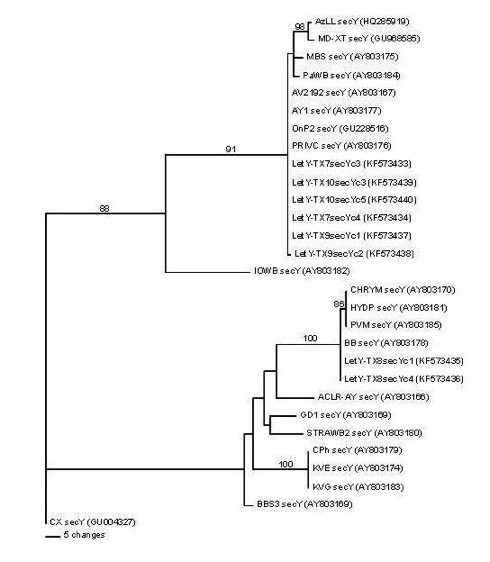 Figure 4: Figure 4: Phylogenetic tree constructed by parsimony analyses of ribosomal protein gene sequences from 16SrI phytoplasma strains. Canadian peach X (CX) phytoplasma was used as the out-group to root the trees. Bootstrap values are shown on the main branches. Bar indicates inferred character state changes. GenBank accession numbers are indicated in parentheses. Sequences submitted to GenBank in this study are in bold. 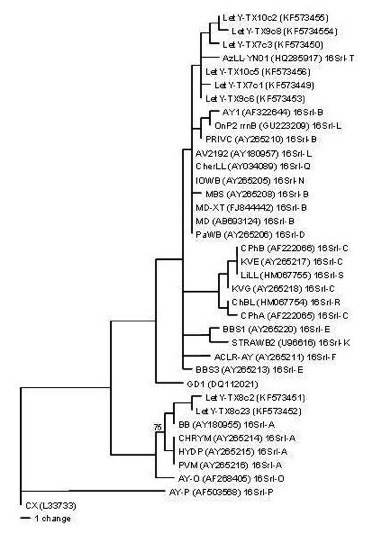 Figure 5: Figure 5: Phylogenetic tree constructed by parsimony analyses of full secY gene sequences from 16SrI phytoplasma strains. Canadian peach X (CX) phytoplasma was used as the out-group to root the trees. Bootstrap values are shown on the main branches. Bar indicates inferred character state changes. GenBank accession numbers are indicated in parentheses. Sequences submitted to GenBank in this study are in bold. Thompson RC, 1944. Reaction of Lactuca species to the aster yellows virus under field conditions. Journal of Agricultural Research 69, 119-125.